Game Description: Skyscrappers is a first person shooter that is unique in its knockback mechanics. Players cannot die by taking damage; instead players can only die when they are shot off the skyscrapers upon which they fight. Damage, however, is still a very important factor as it determines with what velocity a player is launched when hit by an enemy. 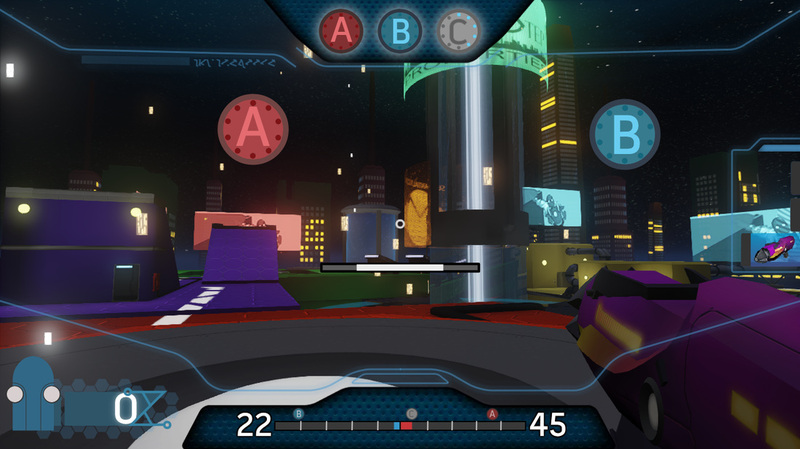 The objective of the game is to capture advertising space by seizing control points across the map. Once a team has received enough advertising by controlling these points, the match immediately ends. One of the early player experience goals for Skyscrappers was for the game to be fun and lighthearted. Because of this, we decided to ditch the typical paradigm of FPS combat and replaced it with one inspired by Super Smash Bros. Instead of shooting to kill, players shoot each other in order to knock them off the the stage. The more damage a character has, the faster they are flung when attacked. A .gif of Yoshi knocking Link back in Super Smash Bros. Copyright Nintendo. There are three weapons that players can use in Skyscrappers: The Executioner, The Launcher and The Leash Gun. 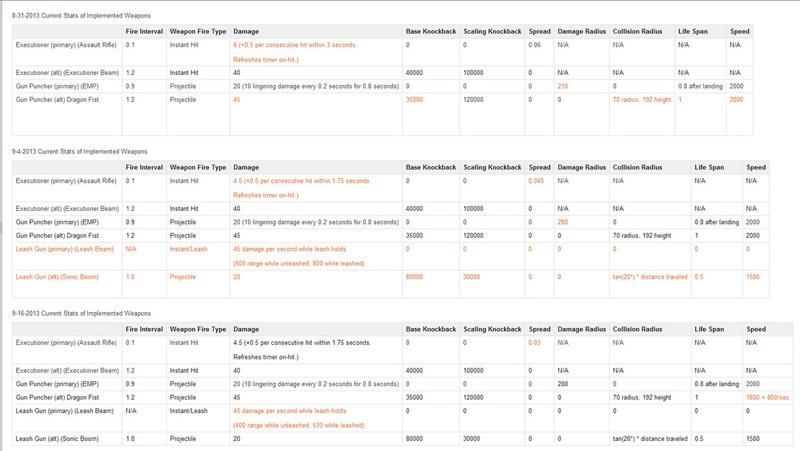 The primary fire of each weapon exclusively applies damage, and thus cannot kill an enemy. The alternate fire of each weapon applies an impulse to enemies hit by it. 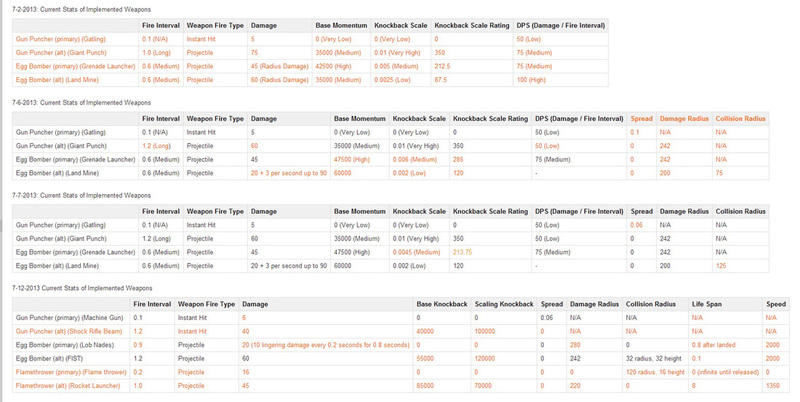 Each alternate fire has a base knockback, which is the impulse applied regardless of the enemy's damage, and a scaling knockback, which is the impulse applied dependent on the enemy's damage. The Executioner has the highest skill ceiling and as such has the highest potential usefulness of all the weapons. However, it is the hardest weapon to hit enemies with, especially at close range. Primary Fire: Mid-Long range Gatling Gun deals bonus damage according to the number of recent tags with the weapon on a given target. Secondary Fire: Infinite range laser that deals significant knockback. The Launcher is a medium skill weapon that shoots projectiles that travel through the environment and collide with anything in their path. Primary Fire: Mid-low range EMP grenade that explodes on impact dealing minor damage to enemies in an AOE. 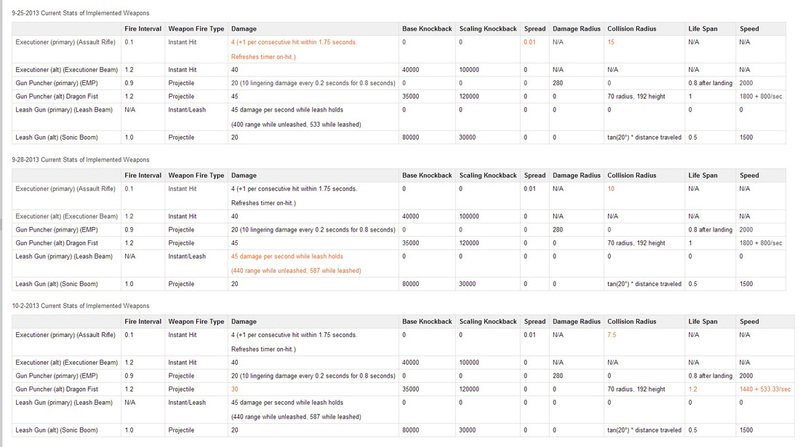 Upon impact, an EMP field remains for short time, dealing medium damage periodically to enemies caught in the blast. Alternate Fire: Mid-low range GIGANTIC FIST that travels linearly through the air dealing extreme knockback to the first enemy it hits. The Leash Gun has the lowest skill ceiling and has the least obvious impact of the weapons, though it provides interesting play and counter play dynamics, particularly in its ability to damage enemies through the environment. Primary Fire: Short range leash that attaches to the first enemy it touches. Once attached, the leash remains connected to the enemy, dealing low damage per second until the distance between the enemy and the player is large enough. The leash gun phases through any obstacles while attached. Alternate fire: Short range cone that expands as it travels, knocking back all enemies hit by it. The strength of the knockback linearly decreases as the cone travels. The cone does not collide with terrain and instead phases through it. One of the core balancing philosophies behind Skyscrappers was that the game be both fair and friendly to new players. This meant the simple weapons needed to not be overshadowed by the higher-skill weapons. Because of this, I made The Launcher have the best knockback of all the weapons in addition giving it a giant projectile. I still wanted the game fair enough for skilled players to use other weapons and succeed but the key was that the game should be accessible and easy to drop in and have fun even for people who don't play First Person Shooters. Download detailed balance changes and justifications for each patch here! Communication: I effectively communicated and articulated my weapons designs to the programmers and was able to quickly fine tune them to a polished level. Game vision: I constantly guided the game's design towards accessibility and fun for new players. Picking up new tricks: I learned and eventually excelled at Unreal's Cascade editor for particle development without having any prior knowledge of it. Level streaming: I had early problems with level streaming and working on a map simultaneously with someone else which resulted in lost work. Poor artistic vision: As the developer with the initial game vision, I was unable to produce a quality artistic vision, so the art team was then tasked with it. They too were unable to create one early on which resulted in lower quality and quantity of art early in the development. Loss of team member: One of our team members who created some of the art for the particles was moved to another team. However, I was able to re-use some of the assets and found creative ways of still producing quality particles. Seeking help: It's important to ask for help when you need it, even if it's something you ought to know. It's better to be embarrassed for a short period of time than waste hours on a problem that should take minutes. Saying what needs to be said: Sometimes, uncomfortable things need to be said regarding the quality of the game if you truly have the best interests of the game at heart. Such things have to be said in a compassionate manner, but it cannot be ignored. Listening to the team: I effectively listened to the team, specifically what they were trying to say, and acted in a way to address their concerns. This was an important lesson before I became game designer on my next project, Identity.